I suppose every NAPHA member has fond memories from their childhood of some amusement park attraction that no longer is there. Perhaps it was a roller coaster long torn down, or it may have been some unusual spinning or flat ride that is no longer manufactured. Or even, perhaps most unfortunate of all, an entire park that was once beloved by all has long since closed where more than one precious memory was lost forever. One of my favorite childhood memories long since gone was what I feel was one of Kennywood's Greatest dark rides, The Ghost Ship. This elaborate dark ride was housed in the building that was originally built as the park's dance hall which opened one year after the park in 1899. The open air dance hall was host to many famous bands throughout the years such as Ozzie Nelson, Benny Goodman, Rudy Valee, and even Lawrence Welk. It received a number of renovations to keep up with the times and was finally enclosed in 1934 to offer winter roller skating. The roller skating was discontinued in just a few years, but the building remained a dance hall until 1953 when it was converted into the Enchanted Forest, a children's walk-thru attraction, which opened in 1954. This walk-thru attraction featured miniature dioramas of famous storybook scenes and featured a tilt room with closed circuit TV so people outside could watch the hilarity inside. The walk-thru received a new facade and new name in 1960, becoming the Enchanted Castle. Some of the scenes were redone, and the addition of a spooky dungeon was included. The building's first ride-thru dark attraction was the Tornado, which opened in 1963. This ride was an Arrow designed dark ride which originally operated at Freedomland in New York. It was purchased by Kennywood a few years after that ill-fated park closed its gates forever. (Two other sister Arrow dark rides were purchased by Cedar Point from Freedomland, the San Francisco Earthquake and the Pirate Ride. Earthquake operated until the mid-1980's until replaced by Berenstain Bear Country and the Pirate Ride operated until 1996.) The Tornado, like the Cedar Point dark rides, was a very elaborate style dark ride which "simulated" the power and fury of one of nature's most unpredictable and destructive forces. Through elaborate, though somewhat primitive, and at times, humorous, animation, Tornado took passengers via their antique auto styled vehicles through a Kansas farm and town being ravaged by a twister. Although popular during its short 4 year run at Kennywood, it was decided that a brand new dark ride designed exclusively for the park would replace the aging Tornado ride. 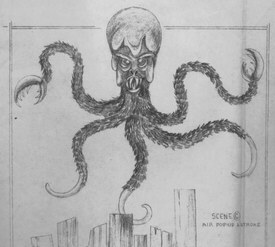 So, in 1966, Tornado was closed and sold to Great Escape Theme Park in Lake George, NY to make way for what would become the park's largest and most elaborate dark ride, the Ghost Ship. (Tornado also operated at Great Escape until 1996 when it was finally retired.) 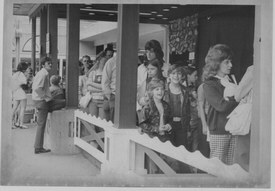 The new ride opened in the spring of 1967 and was much longer in length than its predecessor. 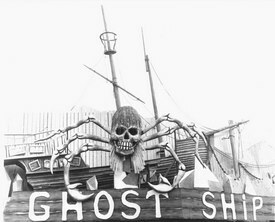 Designed by Amusement Display Associates under the creative talent of its owner, Bill Tracey, one of the foremost dark ride designers of the 1960's, Ghost Ship offered traditional dark ride style bumps and scares along with elaborate sets and theming. Though the animation was still primitive by today's standards, it still was very elaborate for a traditional amusement park of the 1960's. 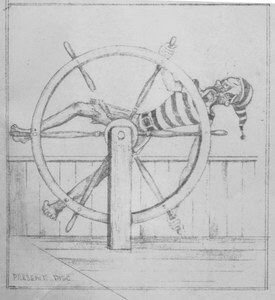 (Remember, Disneyland's Fantasyland dark rides were just as primitive during this time period, and their quintessential, trend setting Pirates of the Caribbean dark ride ironically opened this same year as the Ghost Ship). The facade for the roof for the ride featured a giant wrecked sailing ship washed ashore upon the rocks. A hideous skeleton of some large crab monster with a huge human skull for a head sat over the signage for the ride while its ugly face rocked back and forth. Underneath, the whole front of the dance hall building was transformed into a nightmarish underwater graveyard for lost ships. Passengers boarded their two person ship-shaped vehicles on the left side of the platform.Just to the right of the boarding area, a raised sloping platform sat in the middle of the loading/unloading area. Two cave like openings, the left side slightly higher than the right, flanked each side of the sloping platform. From time to time, a large wheeled dinghy would appear out of the left cave and roll down the platform and enter the right cave. Riding within the battered boat would be a hideous skeleton-like figure resembling the Grim Reaper giving waiting passengers and passersby alike a hint of what was in store for adventurous riders. After boarding their vehicle, passengers waited for the ride operator to dispatch them into the Ghost Ship's winding dark labyrinth. You knew it was your turn when a loud buzzer sounded off in conjunction with the operator's signal light above the tunnel entrance. As the car jerked forward, it moved rather rapidly for a dark ride vehicle and had a strange chain driven motor sound to it. The car made a quick right turn throwing passengers together to enter the tunnel. Once inside, the cars went up a slight inclined ramp and "bashed" through two sets of black doors to enter the building. After your eyes adjusted to the sudden darkness, you noticed that you were in a long mine shaft with eerily glowing green supports. The mine shaft appeared to go on forever as your car sped rapidly down the long corridor. Then suddenly, the car made an abrupt right turn and crashed through the mine wall (another set of double doors). Now, you were in the first of two revolving barrel rooms. 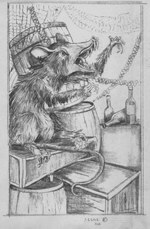 The motion of the barrel around the track was quite dizzying and convincing.Immediately at the end of the barrel was the first animated scene, an old, evil looking fisherman or pirate sitting at a long banquet table about to eat some rather unappetizing looking food. What was unusual about this scene was that the whole scene rocked back and forth like Kennywood's famed Noah's Ark attraction. 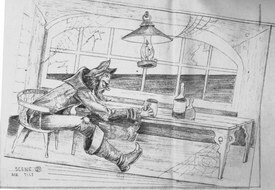 The lights within the banquet scene suddenly went out with a large banging noise as the car made a quick left turn into the captain's quarters of a ship. In earlier years, only large crates and a treasure chest opening and closing were located here. In later years, a large animated polar bear was located here as if ready to pounce on passersby (anything can happen in a traditional amusement park dark ride it seems!). Within this room, the cars made a quick right handed U-turn and then sped down a series of dark winding passageways. Another left handed U-turn, and a hideous lobster man appeared from no where.A quick right handed U-turn, and there was an outhouse with a skeleton sitting inside. He pulled the door closed as the lights went out again and the car followed another long dark hallway. At the end of the hallway, a hideous ghoul appeared to be floating towards the car straight towards you, but an abrupt right turn brought the car out of harm's way. 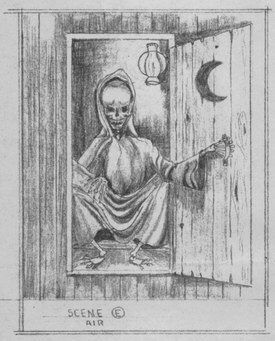 Again, the car crashes through a set of doors, and up over the door frame of the next set of doors was a skeleton with a paint brush and pail. The whole platform that he was sitting on suddenly rolled over as you passed underneath and the paint can's contents of fluorescent red paint appeared to be spilling out right on top of you! (Actually, it was just a red painted piece of canvas attached within the can that fell out to make it appear that the paint can was spilling.) Through the next set of doors, the cars found their way into a red, horizontally striped room. The red stripes on the walls, however, were on conveyor belts moving slowly downward which created the illusion that your car was rising in elevation. Another well done illusion by the ride's designers. 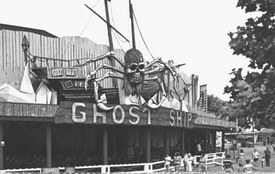 Ghost Ship was an extremely popular dark ride within the park. 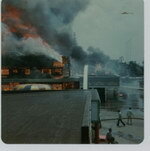 It might still be here today, but as luck would have it, tragedy struck on June 19, 1975. Just two months into Kennywood's season, an electrical fire developed within the dark ride, and the entire ride, not to mention the history of the dance hall pavilion itself, were completely lost. Fortunately, no one was injured during the blaze. 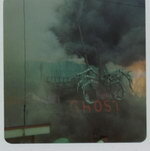 A quick thinking ride attendant led the passengers out before the building became engulfed. Also lost in the blaze were the park's Cuddle-Up ride, then called the Road Runner, which was also located in the building on the far left side directly behind the Golden Nugget refreshment stand. 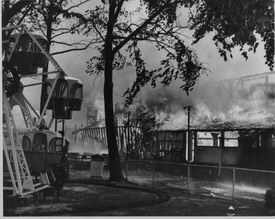 Miraculously, this refreshment stand survived the blaze and still is serving Kennywood's unique sundae cones to the public. Two kiddie rides in nearby Kiddieland were also lost, the park's original kiddie whip and the German automobile carousel ride. The park's Round Up ride, called the Satellite then, located to the right of the building was badly damaged, and considerable damage was done to the park's Calypso ride which sat to the right of the Round Up. 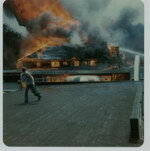 Fortunately, this was the last major fire to occur at Kennywood. The park never closed during the fire that day, they just cordoned off the area from the public as firefighters put out the blaze. During the rest of the season, after the fire damaged structures were razed, sod was planted in the affected area. And if you had never been to Kennywood before that time, you would never had known anything had existed there. In subsequent years, a games building was built behind the Golden Nugget, which later became a pizza stand. The Round Up ride was replaced with a new one and the Calypso was repaired and returned back into operation. A new fountain was installed in front of what is now the Pizza stand with a plaque dedicated to the Kenny family whose farm this land was before Kennywood was founded. Over the years since the fire, different rides replaced the Calypso and Round-Up including a Ranger and a Swing-a-Round. The Round-Up was shipped to Kennywood's sister park, Idlewild, while the Calypso was sold to another park. A new Cuddle-Up was purchased and placed elsewhere in the park until it was permanently removed during the mid1980's. In 1986, the 85 foot high Wonder Wheel permanently replaced all of these rides, including the area that onced housed the dance hall. 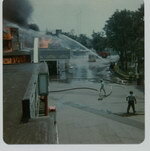 Although for many it may appear that this section of Kennywood had always looked like this. But for those who visited the park before June 19, 1975 know that a once great dark ride once proudly took passengers deep into the spooky recesses of a long sunken Ghost Ship! Since this article was written, many more changes have occured at Kennywood, including the removal of the Wonder Wheel ferris wheel. It was replaced in 2000 by the Aero 360, a Zamperla Hawk attraction themed to the famous black & gold Kennywood directional arrow. Also during this time period, sadly, another Kennywood traditional dark ride, Le Cachot, was removed after the park's centennial season in 1998. This was another Bill Tracy classic dark ride that opened during the early 1970's. As sort of a replacement for this old style dark ride, the park built The Exterminator, a combination dark ride and roller coaster, which opened in 1999. The additon of this new breed of dark ride keeps Kennywood's dark ride/funhouse count at a constant four, including the classic style Gold Rusher, The Old Mill water dark ride (which just celebrated it's 101st birthday! ), and the recently updated Noah's Ark walk thru attraction. Even with the loss of Le Cachot, Kennywood should be applauded. The following is a letter to the editor of NAPHA News, dated November 29, 2000. 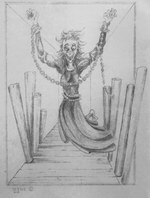 Dave Hahner's article, "The Ghost Ship", in NAPHA News (Vol. 21, No. 2) brought back dozens of memories. I don't know, unless he somehow had a copy of Bill Tracy's original design, how he created such a detailed and fascinating description of the ride layout. It was superbly done. But there are a few items I can add, never before printed. First of all, the cars used on the ride were the old Laff in the Dark vehicles built by Traver Engineering. That ride had been demolished just two years before to make room for the Turnpike. Typical of Kennywood, we saved the cars. It was Carl Henninger's idea to use them on the new ride, and they were ideal for the purpose. As Dave noted, "As the car jerked forward, it moved rather rapidly for a dark ride vehicle and had a strange chain driven motor sound to it." No wonder. Those chain driven motors first operated in 1930. Wonder if there are any others left any where? A few days after the fire, Carl Henninger asked me to make a list of what was lost. It was for the fire insurance claims, of course. Not until after the claim was filed did I recall that in addition to the operating rides, we had used an area behind the Cuddle Up for storage. It contained the single-rider Scotty bumper cars that were used for one season on the Gran Prix and the park's toilet paper supply. One final item. The person who ran through the Ghost Ship to check on riders after the alarm was sounded was not an attendant, but Harry Henninger. He had been walking the midway in front when a ride operator ran out and shouted "Fire".